This chapter traces the Government-General's attempts to transform the symbolic and material landscape of Hanyang, royal city of the Chosŏn dynasty, into the colonial capital of Keijō (Kyŏngsŏng). Through an initial period of urban reforms and a later phase of city planning, the colonial state remade the skeletal and aesthetic frames of Keijō even as it neglected considerable parts of the city, especially in the Korean-populated northern village. To borrow a metaphor used by Gyan Prakash in his study of colonial India, the smooth and sanitary circulation envisioned by officials only reached the city's main arteries, rather than penetrating to the capillary level of everyday life.1 The result was a multilayered built environment, characterized by unlikely juxtapositions of old and new, neglect and excess, and chaos and order. Like other modern cities in the metropole to which planners frequently compared it, Keijō developed in highly uneven ways, a phenomenon further exacerbated by ethnic, class, and other divisions produced through Japanese rule. By its very definition, then, "constructing Keijō" remained a contentious project, one that led concerned officials to invest tremendous financial and ideological resources in transforming this historic capital into the peninsula's showcase city. Although certainly less grandiose in their designs, a diverse group of residents also made assertive claims on the city's spaces, where those who were well placed could seize enriching possibilities, but where many more of the less fortunate residents remained vulnerable to its disrepairs. When Japanese officials annexed the Korean peninsula in 1910, they inherited a city with more than five hundred years of history. Shortly after establishing the Chosŏn dynasty in 1392, the first king, Yi Sŏng-gye (T'aejo), constructed a new royal city at Hanyang to distance himself from Kaegyŏng (present-day Kaesŏng), the main center of power during the Koryŏ dynasty (918-1392).2 Chosen for its geomantic propitiousness, Hanyang developed according to an adaptation of Chinese planning principles, incorporating elements that would legitimate and protect the new dynasty. As figure 1 illustrates, the city followed many continental precedents.3 For example, Chosŏn planners placed the royal family's ancestral shrine (Chongmyo) to the left of the king's main palace (Kyŏngbokgung) and an altar to the state deities (Sajikdan) to the right. Following the Confucian belief in the five elements and their virtues as described in the Book of Changes, the city's five central points, the (1) East, (2) West, (3) South, and (4) North Gates and (5) the Belfry-which corresponded to (1) wood for benevolence, (2) gold for righteousness, (3) fire for propriety, (4) water for wisdom, and (5) earth for trust-were laid out around Kyŏngbok Palace. The main north-south axis (Chujak taero) emanated from the palace, while the city's other main arteries included Chongno, which extended from the West Gate (Sŏdaemun) to the East Gate (Tongdaemun), and another road extending from the Belfry (Posingak) to the South Gate (Namdaemun). Officials had also ensured that the city met the geomantic prescription that it be surrounded by four auspicious mountains, through which the proper amount of energy (ki) could pass. From these nearby mountains flowed a major source of the city's water supply, the Ch'ŏnggye Stream.4 Although departing from Chinese cities with square or rectangular enclosures, Chosŏn officials constructed an oval wall to defend an urban basin naturally surrounded by four major mountain ranges. As these riots suggest, Hwangsŏng's perilous position within the transnational politics of East Asian imperialism necessitated internal political changes that were also reflected in city spaces. In spite of Confucian rhetoric calling for a popularly oriented nation, the kind of Korean people envisioned by the elite architects of the Great Han Empire was closer to dutiful subjects rather than citizens endowed with individual rights. Therefore, where once virtually the entire city consisted of royal spaces, government officials now created stronger connections between the symbolic center of the monarchy and groups of socially stratified Koreans. The new streetcar line linking the imperial palace complex with the commercial district along Chongno was one particularly symbolic manifestation of this important transformation. Indeed, the new imperial city witnessed a noticeable increase in the number of contact zones between the sovereign and his subjects, including the area in front of the Taehan Gate (the entrance to Kyŏng'un Palace), where Hwangsŏng's residents gathered for new national events, such as Kojong's elevation in 1897 from king to emperor.14 That these changes reflected new strictures on personal freedoms is supported by the fate of the short-lived Independence Club (1896-98), a group closely associated with the urban reforms of this period.15 In fact, when some members pushed for a more participatory constitutional system, the Korean court quickly disbanded the club and centralized state authority under the newly elevated emperor, Kojong. With Japan's victory against Russia in 1905 and the subsequent establishment of a semicolonial protectorate government, the monarch-centered project to transform Hwangsŏng into a national center became nearly impossible, especially after Kojong's forced abdication in 1907. When Japan annexed the peninsula in 1910, early colonial officials hijacked these reforms and began to institute their own improvements, remaking the city's spaces into a showcase of Japanese modernity. However, the modern project of physically and symbolically transforming the capital initiated by the leaders of the Great Han Empire continued after 1910. The major change was, of course, that thereafter a colonial state now attempted to use spatial reorganization to incorporate Koreans as subjects of the Japanese emperor. This project of respatialization was, like the annexation itself, launched on the path of extinguishing and then desacralizing the Korean royal house. It thus began in symbolic fashion with the strategic reconstruction of the city's palaces, whose private grounds Japanese officials converted into civic parks and other public monuments. Made accessible for the first time, these once sacred sites were used to interpolate the Korean masses as subordinated members of the new imperial community. Before annexation, Japanese commentators-drawing on recent experiences of converting domanial complexes from the Tokugawa period into parks, schools, and other public spaces-commonly referred to Kyŏng'un Palace, Kojong's residence, as the "kingdom's castle" (J: ōjō; wangsŏng) or the "imperial castle" (J: kōjō; hwangsŏng). Already by 1907, protectorate officials had begun to downplay the symbolic importance of Kyŏng'un Palace, when they forced Kojong to abdicate in favor of his young son, Sunjong, Korea's last (puppet) emperor, whose residence was then relocated to Ch'angdŏk Palace. Between 1908 and 1911, Japanese officials, following the Meiji model of "modernizing" Ueno Park under imperial auspices, transformed the adjacent Ch'anggyŏng Palace into another public site, outfitted with a royal museum, zoo, and garden.20 Meanwhile, authorities quickly moved to destroy or sell buildings related to Kyŏnghŭi Palace, which had functioned as part of the ruling palace complex during the Great Han Empire.21 Parts of Kyŏng'un Palace, symbolically renamed Tŏksu Palace after Kojong's 1907 abdication, remained, although it was stripped of its modernizing emperor and the powerful symbols he wielded. In 1910, officials built a Western-style art museum on the grounds of this palace and, in 1914, replaced the Ring Hall Altar with another modern facility, the railway-operated Chōsen Hotel.22 A similar fate awaited Kyŏngbok Palace, the "oldcastle" (J: kyū-ōjō; ku-wangsŏng), the king's main residence until its destruction by Hideyoshi's invasions of 1590s. Although partially rebuilt during the reign of Kojong's regent father, the Hŭngsŏn Taewŏn'gun (1863-73), this "old castle" had remained in disuse until its symbolic opening to public viewing in 1908.23 During the colonial period, this desacralized site became home to the new Government-General building (est. 1926) and the stage for several spectacular expositions. In this this way, Kyŏngbok Palace grounds aimed to display Japan's authority over the peninsula's ineluctable "progress" and Koreans' subordinated participation in colonial modernization. In addition to the symbolic deconstruction and reconstruction of Hanyang/Hwangsŏng's palace grounds, Japanese officials also sought to rearrange roads and neighborhoods in order to advance both colonial authority and capitalist accumulation. First carried out in late-nineteenth-century Tokyo, these "urban reforms" (J: shiku kaisei; sigu kaejŏng; literally, "re-forming city districts") included widening and straightening extant roads, expanding waterways for sewage and, as mentioned above, refashioning domanial and religious spaces into civic parks and plazas.24 Together, they aimed at a partial upgrade of the existing city rather than the systematic transformation of space that would characterize the planning movement of the 1920s and 1930s. In early Keijō, planners, borrowing the German term for urban regulations (Regulierung der Städte), focused their efforts on sanitizing, widening, and straightening the city's main arteries and constructing new ones in order to establish a more rationalized system of roads.25 Over these roads, officials hoped to lay a series of radials connected to three symbolic rotaries in the creation of what bureaucrats liked to call a "civilized city," a term downplaying similar modernizing techniques recently used by the Great Han Empire. This ambitious plan, modeled on the one first implemented in colonial Taipei, had failed in Tokyo, where entrenched landowners prevented its implementation.26 To be sure, the protectorate and early colonial governments, backed by a coercive military force, had far greater leverage to impose urban reforms in Korea than officials in the metropole. However, even in Keijō, these efforts did not go uncontested, particularly by Japanese settlers who, as residents of the peninsula since the early 1880s, sought to influence the city according to their own interests. The Residency-General and its successor, the Government-General, were themselves far from monolithic or coherent, either in their motives or in the exercise of their authority. Even the most ambitious planners soon realized that the city's existing structure and perennial finance problems would severely limit what they could accomplish. As a result, (semi)colonial officials, drawing on modernizing tactics developed in Meiji Japan and its fledgling empire, succeeded in implementing only a limited program of urban reforms. The globally circulating ideas of city planning invoked by Mochiji are clearly seen in the first urban reform plan for Keijō (1913-17), which was issued in June 1912 and which was to have an astounding cost of three million yen (see figure 3).36 Building on reforms made during the Great Han Empire, this ambitious plan aimed to superimpose a radial and grid system of roads onto the city's existing street formation. While north-south and east-west roads would create the grid, the diagonal roads would form three rotaries, each converging on an important power center in the early colonial city. Officials located one such plaza in front of Kyŏngbok Palace where Taihei Boulevard met Chongno, the main east-west axis during the Chosŏn dynasty. This plaza aimed to displace Tŏksu (formerly Kyŏng'un) Palace, the center of power during the Great Han Empire. As figure 3 shows, constructing a plaza in front of Kyŏngbok Palace (the planned site of the Government-General building) would require three new radial roads emanating in northwesterly, northeasterly, and southeasterly directions. Urban reformers planned a second plaza in Kōgane-machi where Kōganemachi Avenue (present-day Ŭljiro), an east-west thoroughfare, bisected the southern half of the city.37 This proposal aimed to placate the commercial interests of the expatriate community, which repeatedly petitioned the Government-General to include Honmachi Street in its urban reforms.38 Although these efforts fell upon deaf ears, officials did plan to make most street improvements in the southern village, including repairs actually completed on Kōganemachi Avenue, one of four major arteries that converged on the plaza. Another radial emanating northwesterly from Kōgane-machi would have connected this Japanese-dominated area to a third plaza in the heart of the northern village. The Taean-dong Plaza would have also linked Kyŏngbok Palace and Pagoda Park, the only civic space of its kind in the northern village. 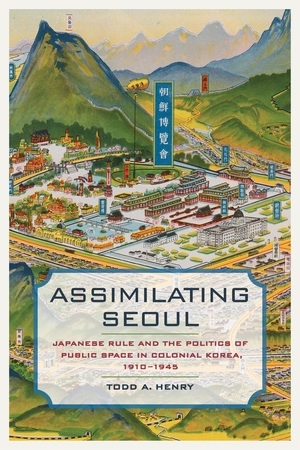 The significance of these urban reforms becomes clear in the context of the colonial state's desire to promote "assimilation," a term officials often used to describe the city's respatialization.39 From the start, these efforts focused on amalgamating the city's Korean and Japanese populations through a unified administrative system. To this end, officials promulgated a law in 1914 that disbanded the legal authority of the Japanese community and other foreign settlements still retaining extraterritorial privileges. Two years later, the Government-General passed another ordinance that placed both Koreans and Japanese under the official supervision of neighborhood representatives. The north-south road projects completed during the first phase of urban reforms embodied attempts to connect the Korean neighborhoods of the northern village to the settler community of the southern village.40 The most important of these north-south roads continued to be Taihei Boulevard, a central axis officials hoped to extend (along with train and telephone connections) southward to connect the central city to the boomtown of Yongsan.41 In the fall of 1917, 150,000 residents gathered to celebrate the unveiling of a bridge built across the Han River just south of Yongsan. The new bridge, which linked the historic core in the northern village to the booming parts of southern Keijō, symbolized one important shift in the city's development.42 Featuring both Japanese geisha and Korean kisaeng in another popular symbol of assimilation, the festive unveiling ceremony marked the end of the first phase of urban reforms and inaugurated the second phase (1919-24). As figure 4 shows, the Government-General's second urban reform plan not only included the southward extension of Taihei Boulevard in the direction of Yongsan, but also highlighted the northern terminus of this thoroughfare. While the new plan was significantly scaled back from its predecessor from 1913 and made almost no reference to the ambitious project of superimposing radial and grid roads onto the precolonial configuration of streets, it still showcased the growing authority of the Government-General at the expense of the disenfranchised settler community. In particular, the plan jettisoned the aforementioned proposal for an interlocking system of centers, including the Kōganemachi Plaza, leaving the future site of the Government-General building as the only plaza.43 Officials had already used this site to stage the Industrial Exhibition in 1915, the first major spectacle of its kind in colonial Korea. Now urban reformers continued to highlight the former grounds of Kyŏngbok Palace by relocating the one remaining plaza from the plan from 1913 to the area in front of the palace's main gate, Kwanghwamun. During the second phase of urban reforms, this plaza, enlarged more than two times the width of the broadest city thoroughfare, worked to spotlight the new Government-General building at the expense of the expatriate community. 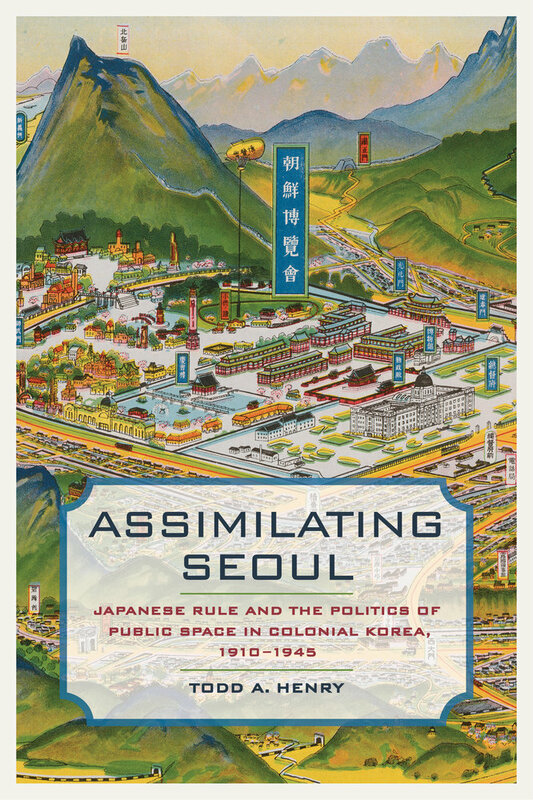 Assimilating Seoul, the first book-length study written in English about Seoul during the colonial period, challenges conventional nationalist paradigms by revealing the intersection of Korean and Japanese history in this important capital. Through microhistories of Shinto festivals, industrial expositions, and sanitation campaigns, Todd A. Henry offers a transnational account that treats the city’s public spaces as "contact zones," showing how residents negotiated pressures to become loyal, industrious, and hygienic subjects of the Japanese empire. Unlike previous, top-down analyses, this ethnographic history investigates modalities of Japanese rule as experienced from below. Although the colonial state set ambitious goals for the integration of Koreans, Japanese settler elites and lower-class expatriates shaped the speed and direction of assimilation by bending government initiatives to their own interests and identities. Meanwhile, Korean men and women of different classes and generations rearticulated the terms and degree of their incorporation into a multiethnic polity. Assimilating Seoul captures these fascinating responses to an empire that used the lure of empowerment to disguise the reality of alienation. Todd A. Henry is Associate Professor of History at the University of California, San Diego.